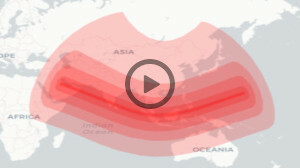 Is the December 26, 2019 Solar Eclipse visible from Coimbatore, India? Solar Eclipse of December 26, 2019 in Coimbatore, India will be visible as a ? eclipse. ? percent of the Sun will be covered by the Moon. The show begins with partial phase of the eclipse (the Moon starts to touch the Sun's edge) at ? of the local time and ends at ?. Maximum phase of the solar eclipse takes place at ?. Magnitude (fraction of the Sun's diameter covered) is ? Annular phase of the Solar Eclipse (the Moon covers the Sun center) begins in Coimbatore, India at ? and finishes at ? of the local time. Duration of the annular eclipse will take ?. See more information about December 26, 2019 solar eclipse in Coimbatore, India in the tables below. Annular vs. Total. What is an annular solar eclipse?